Pasta has to be one of the easiest and cheapest things in the world to make. As is the case for many of us I’m sure, pasta dishes in my kitchen are rarely based on a recipe but on whatever happens to be in my cupboard and rapidly going off in the bottom of my fridge. This was the case one weekday a few months ago, coming home from a long afternoon of after school sport. The freezer yielded a chorizo or two and everything was tossed in to make this simple dinner that the whole family enjoyed. If you decided to make this, do make any exchanges that take your fancy: passata can be replaced with any variety pesto and chorizo with bacon or chicken – use whatever floats your boat. I’ve costed this recipe at $13 using Woolworth’s prices, but I do find it much cheaper when I shop at my local grocer instead. Serves 6. Get a large pot of water boiling for the pasta and add the uncooked pasta as soon as water is rapidly boiling. Keep checking and stirring so pasta doesn’t stick to the bottom of the pot. 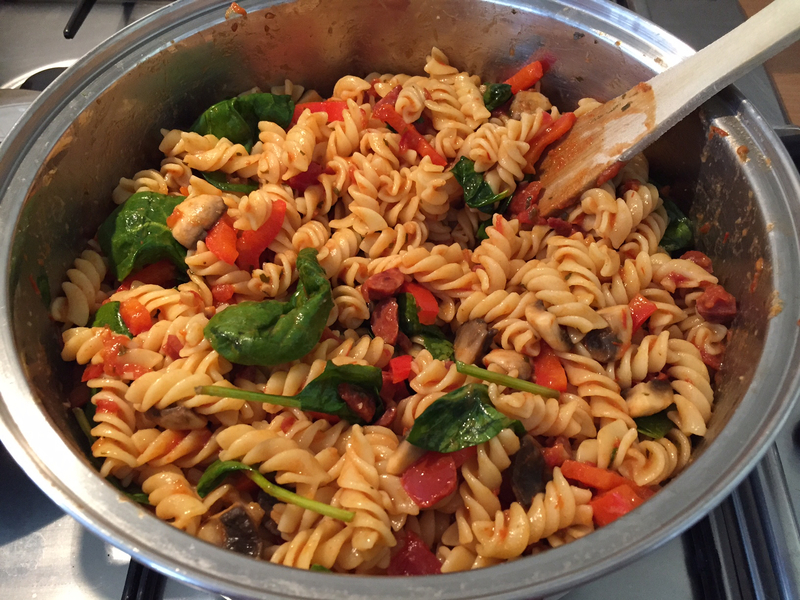 When pasta is close to al dente, add mushrooms and capsicum to the frypan with the chorizo. Continue frying until just soft. 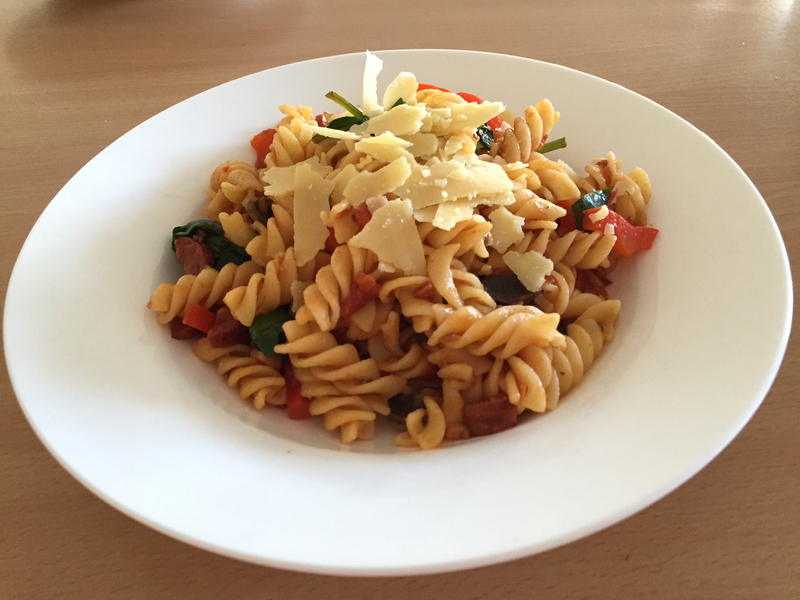 Drain pasta, turn back into the pot, add the chorizo and vegetable mix, the bag of baby spinach and the passata. Toss until combined well and spinach has wilted. Serve immediately and top each offering with shavings of parmesan cheese. Enjoy! Yum! We’re having chorizo pesto pasta tonight! I think the added veggies might put my family off. They prefer salad on the side.